NEW BALANCE SAY they’re taking customisation much further than choosing colours or other aesthetic details: The athletic brand is introducing sneakers that use 3-D printing to create a plate on the sole of the shoe that is supposed to enhance performance with every step. Each athlete runs on a sensitive track to gauge how their feet move; 100 sensors are placed on an insert inside the shoe to measure pressure at different points; and a motion capture system — like the ones used for video games and movies — adds stride and broader movement into the equation. 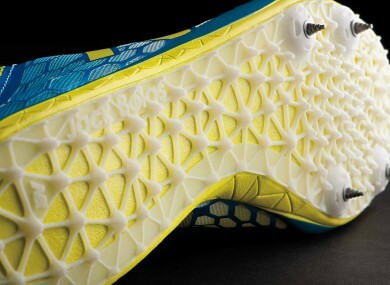 Based on the biomechanical data, custom spike plates, the part of the shoe that actually connects with the ground, are created. The new process was first reported by Wired magazine today. Right now, the process is only for New Balance elite, sponsored athletes, but, said Katherine Petrecca, the company’s business manager of studio innovation, that will change with time. “The technology is early and our implementation is still really in a very early phase, but you can envision as the technology improves and capacity increases — and cost comes down — the audience who will benefit from customization will just grow and grow and grow. This will get down eventually to the casual athlete,” she said. Some top runners helped in the development: 1500-meter World Champion gold medalist Jenny Barringer Simpson, 2012 US Olympian Kim Conley, 2012 British Olympian Barbara Parker and All-American runner Jack Bolas. A bonus? The addition of the athlete’s signature to the plate as if they were signing an autograph, noted Chris Wawrousek, studio innovation lead designer. The combination of demand and technology felt like a watershed moment for the industry, said Wawrousek, studio innovation lead designer. “It feels like a new industrial revolution in some ways. We’re no longer limited by scale to produce a product, and customization can be totally practical,” he said. Email “3D printing, biomechanical data and custom spike plates? New Balance running customisation in new direction ”. Feedback on “3D printing, biomechanical data and custom spike plates? New Balance running customisation in new direction ”.